Umadevi R, Anantha Eashwar V M.
Background: Depression an illness that affects both the body and mind and is one of the leading causes of disability, decreased productivity, workplace absenteeism, and high suicide rates. If diagnosed at an earlier stage, the associated morbidities can be prevented, and the prognosis will be good. Objective: The objective of this study was to find out the prevalence of depression in an urban area of Kancheepuram district, Tamil Nadu. 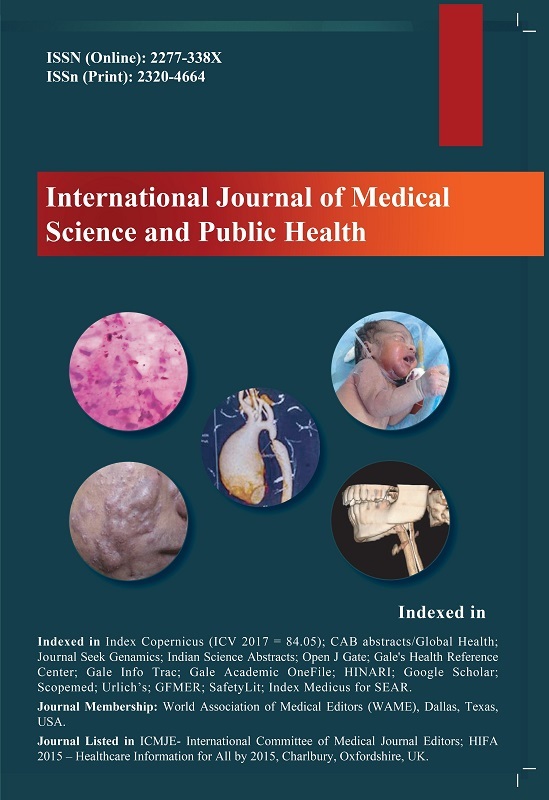 Materials and Methods: This is a descriptive cross-sectional study conducted among outpatients attending Urban Health Training Centre situated in Anakaputhur, an urban area of Kancheepuram district, Tamil Nadu. All the outpatients >18 years of age attending the Urban Health Training Center during the month of August were including in the study after obtaining informed consent. A pre-tested structured questionnaire was used to collect the sociodemographic details and Patient Health Questionnaire -9 questionnaire to assess the prevalence of depression. Data were analyzed using SPSS version 22. Results: The prevalence of depression was found to be 33.1%. It was higher in females (38.1%) when compared to males (27.3%). Around 12.3% of the participants suffered from mild depression, followed by moderate (14%), moderately severe (5.7%), and severe depression (1.4%). Nearly 44% of the depressed patients felt somewhat difficult to carry out their everyday activities. Among male participants, depressed persons were more likely to be alcohol and tobacco consumers. Among female participants, depressed persons were more likely to be unemployed. Conclusion: The high prevalence of depression shows that apart from increasing mental health services and integrating this with general health services in our community there is also a dire need to focus on greater Information, Education and Communication activities regarding awareness of causes of the depression and its prevention. This can lead to early diagnosis and management which can improve the overall morbidity due to depression.